Church & Culture Blog | Church and Culture. Here in verses 9 and 10 Paul is describing the poor. It is not until verse 17 does Paul give instructions for the rich. It is not the contented poor he has in mind, but the envious poor, those who ‘want to get rich’ and are motivated by ‘the love of money’. Read the stories of Adam and Eve, Achan, Judas, and Ananias and Sapphira, they all came to grief through some form of enviousness. Many people will say, “Money is the root of all evil.” This is one of the most misquoted passages of Scripture; it is true that becoming consumed with the quest for material luxuries can sidetrack even the most well-meaning Christian. 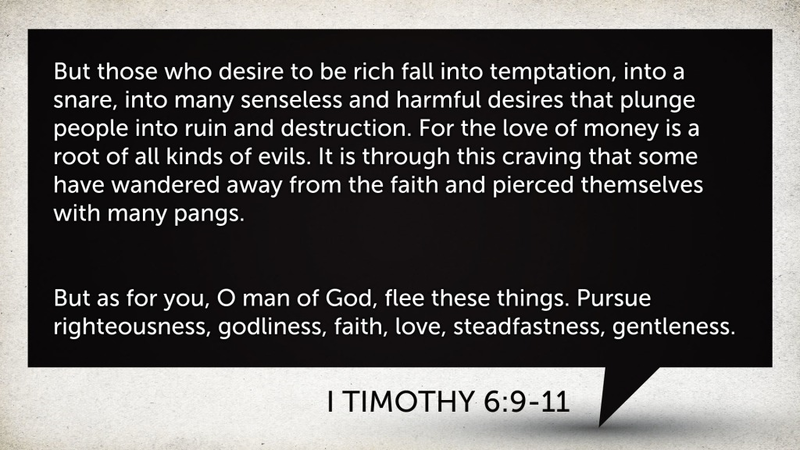 In verse 11 Paul says to Timothy that you are to be a contrast to the world, who chase after riches. Timothy was to do the opposite, he was to flee to from all this and not to allow greed to distract him from the things that are really worth going after: righteousness, godliness, faith, love, endurance, and gentleness. Like Timothy, we should concentrate on running away from evil. But we run after many things which attract us, like pleasure, promotion, fame, wealth and power. Instead, we should concentrate on the pursuit of holiness which is righteousness, godliness, faith, love, steadfastness, gentleness. So how do you acquire all these great things? You ask God to build them into your life. Then be ready for the way he does so! For example, is God allowing you to go through hard times? Now is a great time to learn endurance! Don’t quit. Don’t give up hope. Endurance is learned by enduring, not by avoiding hardship at all costs. What about pursuing love? Maybe God has linked you in some way with a person who’s very hard to love. Love that person anyway! Pray for that person. Do something kind for that person. Love grows the most when it’s the hardest, and the person who is hardest to love probably needs love the most. There is no particular secret to learn, no formula to recite, no technique to master. We are simply to run from evil as we run from danger, and to run after goodness as we run after success. That is, we have to give our mind, time and energy to both flight and pursuit. Once we see evil as the evil it is, we will want to flee from it, and once we see goodness as the good it is, we will want to pursue it. Pursuing riches takes a lot of effort. So does pursuing godliness. Each will take you in a different direction. One leads to grief; the other, to joy. So choose your path wisely. In March 2015 I turned the big 5-0! Really? Fifth? Wow I made it to fifty. I just kept saying it over and over again. It just seems surreal. But to tell you the truth it has been easier to except and turn fifty then it was to turn forty. I just remember forty being a depressing time. I think it has to do more with what is going on in my life right now. It has me more excited about the future then before. You see I also just received my ministry credentials with the Assemblies of God. At forty I was just spinning my wheels and going nowhere. Leading up to turning fifty was a little eerie. Let me explain. I will have to go back in time to when I was turning twenty-five. I was living life for myself at the time. I only thought of two things and these two things consumed my life. They were working and drinking. Nothing else mattered. I was a selfish, angry, and bitter individual. I had nothing to live for or to look forward to. I remember thinking to myself and saying to people that as I was turned twenty-five my life was half over. I knew if I kept going at this rate life would be short. I would be dead by time I turned fifty. Then the Lord Jesus Christ would get a hold of me. I moved to Denver, Colorado and meet my wife Karen. Three years into our marriage we were baptized into the Holy Spirit. We came to know and grow in the Lord together. In Jesus Christ I became a new creation. He has worked on me and through me; He has given be hope and peace. But, that is for another story. Back to turning fifty. Those words; I will be dead by the time I turn fifty would never go away. It was not something that haunted me, controlled me or disabled me but was always a lingering thought on my mind. Sometimes I think it was a reminder of where I was then and what the Lord has done for me since. Thank you Jesus! But the six months leading up to my birthday the thought would come more often. When I talked to Karen about it she would just dismiss it. She didn’t what anything to do with it. But still, it was just something that was stuck in my gut. It was a feeling that would not go away.